1870-1879 autograph album that belonged to Emma Eliza Sprague of Lancaster, Wisconsin. 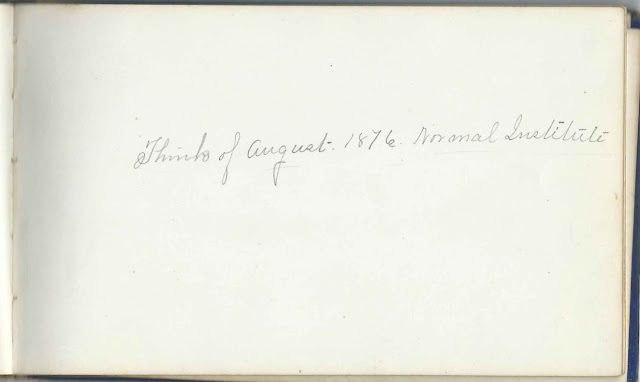 Interestingly, an earlier post featured an album owned by an Emma Sprague of Watertown, Wisconsin. 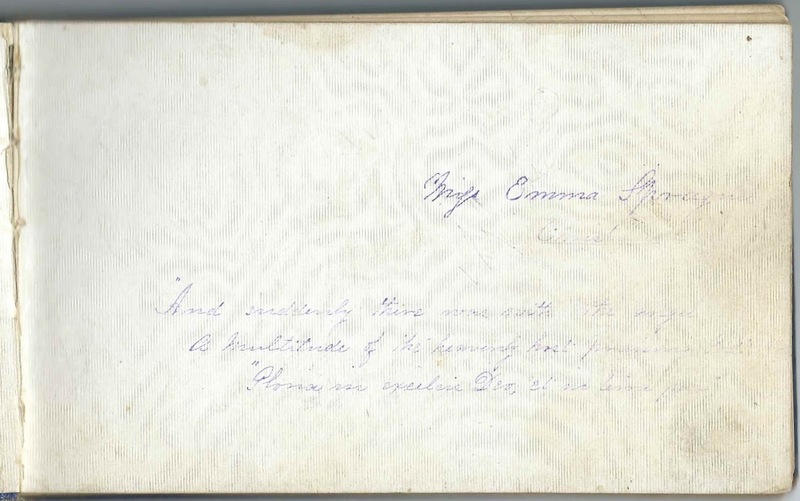 I don't know if the two Elizas were the same woman, but, intriguingly, one Eliza was involved with the Temperance Movement and the other was the Superintendent of a Juvenile Temple before her marriage. 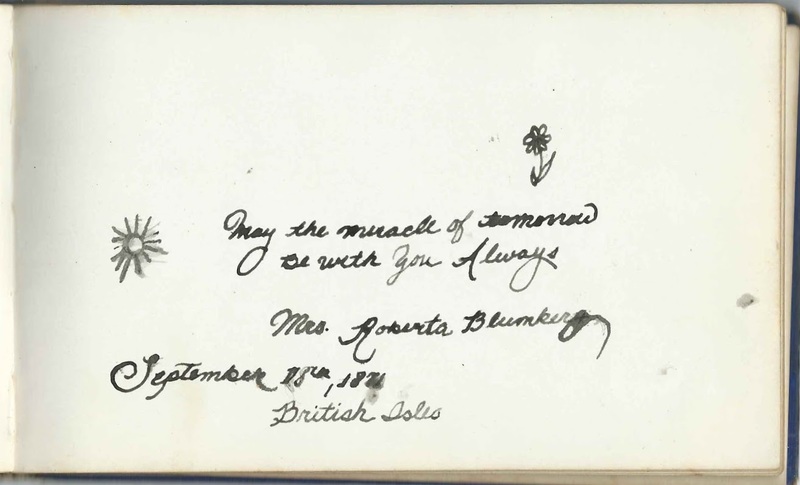 The album measures approximately 7" x 4" and contains the sentiments of 29 of Emma's friends and schoolmates at Lancaster Normal School. An alphabetical surname list and an alphabetical list of the signers, together with any information they offered, appear at the end of this post. 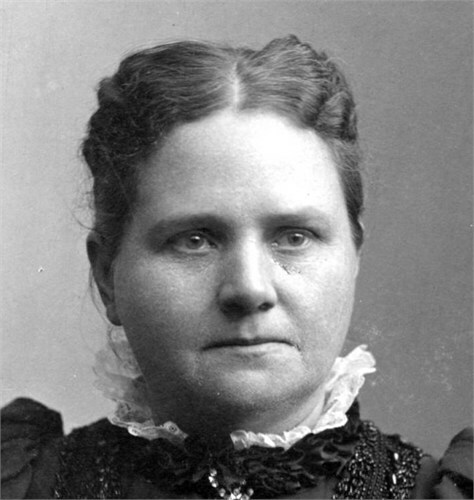 Emma Eliza Sprague was born January 25, 1854 at Beetown, Wisconsin, the daughter of Edward and Emma (Andrews) Sprague. Before her marriage in 1884, she apparently attended the Normal School at Lancaster, at least in 1876, as the page below suggests. The 1880 Census of Lancaster, Wisconsin, shows that Emma was the Superintendent of a Juvenile Temple. 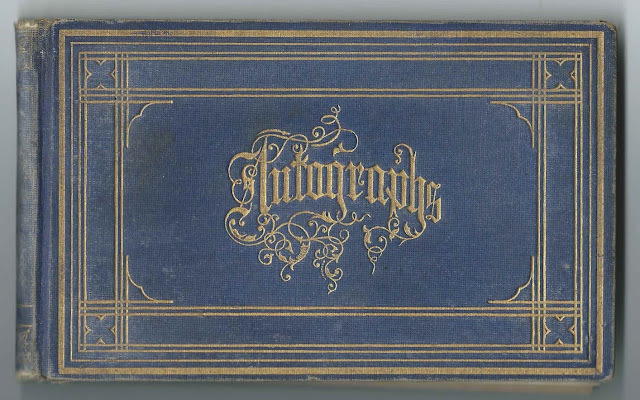 On June 12, 1884, Emma Eliza Sprague married Emerson Giles Reeves, son of James Clark Reeves and Elizabeth Ann (Titus) Reeves. Emerson was born May 2, 1844 at Oxford, Wisconsin. At some point before 1900, Emerson and Eliza moved to South Dakota. They raised, I believe, four children: Edith Gertrude Sprague; Harrison Sprague; Harry E. Sprague; and Althea Margaret Sprague. Emerson worked as a farm implement dealer and as a real estate agent, while Emma operated a boarding home. Emerson died in 1922, and Emma in 1941. A family researcher has graciously allowed me to include photographs of Emma and Emerson in their middle age. 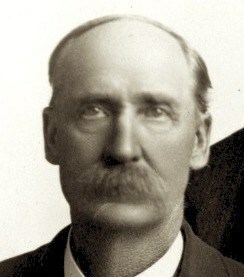 Below, a photograph of Emerson in 1864. 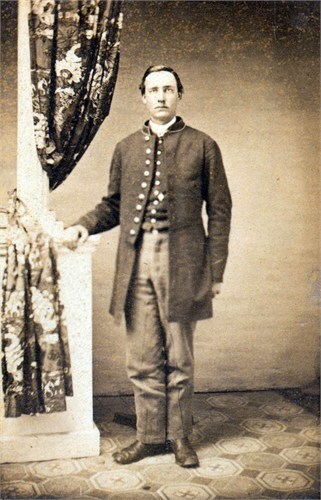 Please contact me if you would like to collaborate with this researcher, who has many more photographs of the Reeves family, including the children of Emma and Emerson. 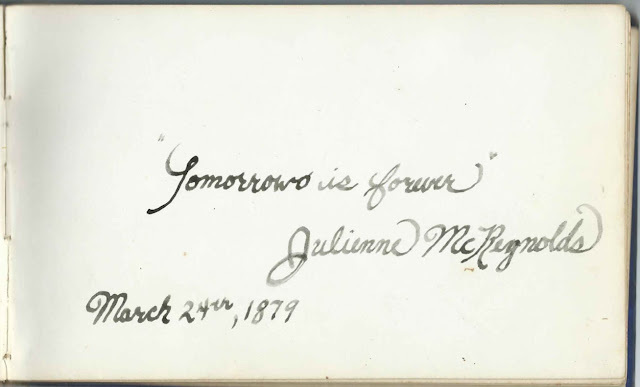 Juliette McReynolds inscribed a page on March 24, 1879. 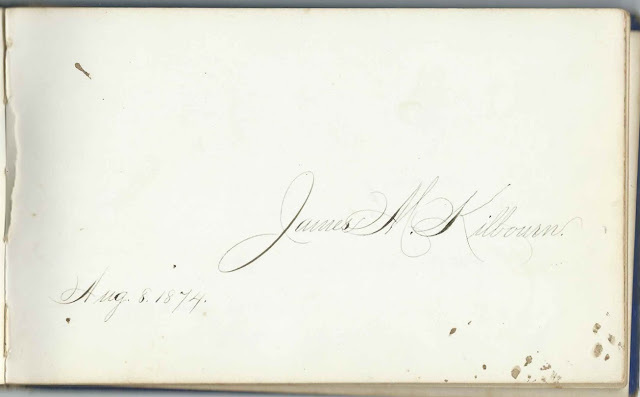 James M. Kilbourn inscribed a page on August 8, 1874. 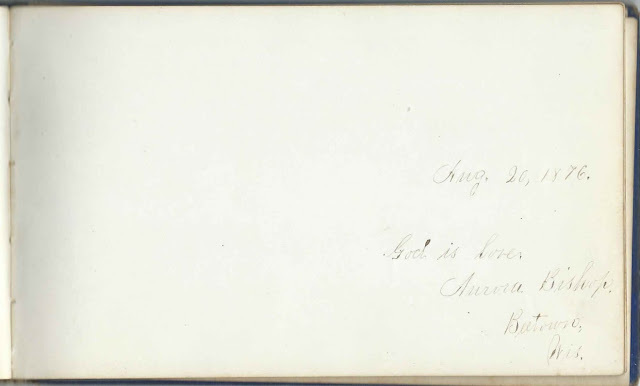 Thanks to a stain at the end of her name, I'm not sure of the exact surname of the signer who might be Mrs. Robert Blumker of the British Isles, who inscribed her page on September 8, 1871. Aurora Bishop of Beetown, Wisconsin, signed a page on August 20, 1876. Jonathan Wilder signed a page on June 19, 1871. 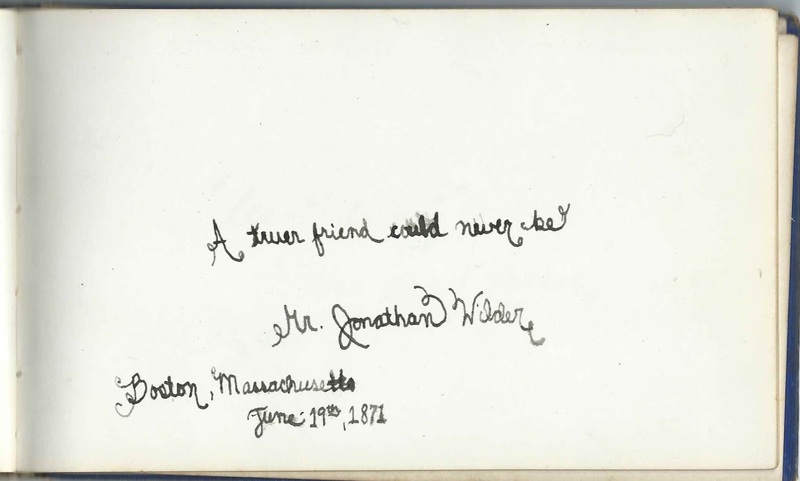 Either he signed the page at Boston, Massachusetts, which would mean that Emma had taken a trip East, or Jonathan hailed from Boston. 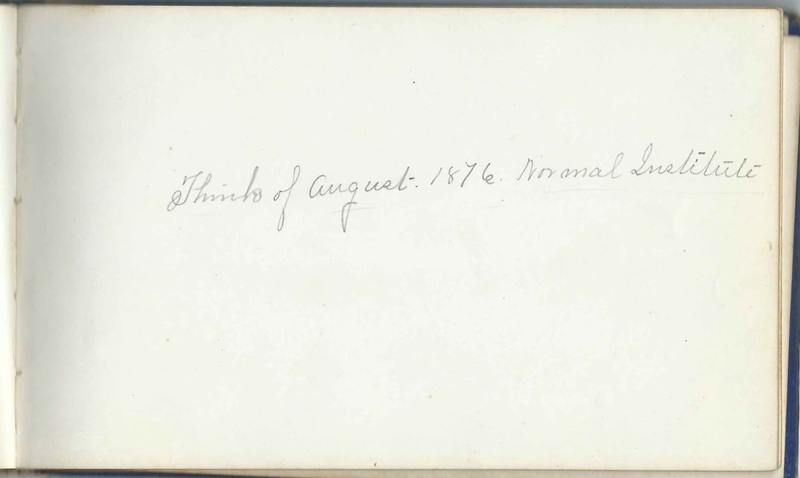 Unsigned: "Think of August 1876 Normal Institute"
Daisy; "Remember the 10th of July 1874"